Back in July 7, 2009, I added an entry on this blog about Bletchley Park, a super-secret World War II cryptograohic center in England used by both British and American forces to decode intercepted Nazi communications. This was also in effect the birthplace of computers. NOW, November 1 2012, comes news of a startling new development. David Martin, 74, of Surrey in England recently decided to restore a long-disused fireplace in his home. Upon clearing out the chimney he discovered the skeleton of a long-dead carrier pigeon complete with a message tube. Most likely enroute from German-occupied Europe to Bletchley Park, it carried a coded message. The bird probably stopped to rest after the long cross-channel flight, became overcome by fumes from the chimney, died, and fell in. The message is now at Bletchley being decoded. What will it say? Is it still top secret? Stay tuned. Carrier pigeons have long been used by military forces to carry messages, and can reach speeds of 80 mph on distances of up to 700 miles. The RAF trained about a quarter-million such birds during World War II. They were dropped into Nazi territory using mini parachutes. Our intelligence agents on the ground then inserted messages into their red tubes and sent them back to England on their own wings. Visiting London? Learn much more about Bletchley Park and many other intrguing places nearby by checking out my new app for the iPad, iPhone, and iPod Touch: London Travel: a Guide to Great Day Trips. It's full of current, up-to-date information, special maps, day trips, walking tours, offbeat destinations, and much, much more. Disbanded in 1976, the former super-secret Army Security Agency is now the subject of several books written by veterans of that clandestine organization. As we all get along in years our memories are finally being committed to paper or at least to web sites. And they can now be read by anyone, with no security clearance or “need to know” restrictions. I’ve just finished reading an outstanding example of this literature. T.H.E. Hill’s light-hearted novel Voices Under Berlin concerns the humorous adventures of Kevin, a Russian-language linguist stationed at a top-secret ASA listening post right next to the Berlin Wall at the height of the Cold War. Hill’s incisive tale of blundering spares no one — Americans, Germans, Russians, Privates or Generals. As you might suspect, the author’s name is a pseudonym, taken from the agency term “The Hill” that referred to operations centers. His moniker “Monterey Mary” means soldiers who graduated from the Defense Language Institute in Monterey, California. I was surprised to see the word “moose” used as far away as Germany; anyone who served in the military in the Far East during the postwar years knows what it means. Although the story is fiction, it is based on real-life events revolving around a secret tunnel (photo of the real tunnel, left) dug by American spy agencies in the early 1950s into the Soviet Sector of Berlin for the purpose of intercepting Russian military communications by tapping into their underground cables. One reviewer commented that “The 9539th does to the Secret Cold War what the 4077th did to the Korean War,” an obvious comparison with the popular book, movie, and TV series M*A*S*H.
Former ASAers will love this amusing tale, as will fans of off-the-wall espionage stories. There's more about this part of Berlin on this blog at Free Sample Chapters, Berlin Kreuzberg. Clicky. And still more in my Daytrips Berlin & Northern Germany and Daytrips Germany guidebooks (links below). You might also be interested in my 1969 stroll into communist East Berlin, recounted on this blog. And click here to find out about the ASA. Also CHECK OUT T.H.E. Hill's website on ASA tunnel links. AND his post on ASA Website Links. CHECK OUT Voices Under Berlin at Amazon by clicking on its title in the box below. And to learn more about the Berlin where all this happens check out my guidebooks Daytrips Berlin and Northern Germany and Daytrips Germany by clicking on its title in the other boxes below. Over two dozen posts, and many, many comments, on this blog pertain to the former Army Security Agency and especially to its units in Japan during the 1950s. I was a very small part of this, as were hundreds (possibly thousands) of other guys. These postings get scores of visitors every day, mostly from veterans who were in or associated with the ASA and have at least some idea of what it was all about. Others may wonder just what was this highly secretive and mysterious branch of the U.S. Army, what did it do, why does it no longer exist, and why so little has been written about it. First of all, why did so many draftees choose three years in the ASA instead of the required two years of regular army service? It was promoted as a rather exclusive group culled from only those scoring in the top ten percent on aptitude tests, having a high IQ, and qualifying for both Top Secret and Crypto security clearances. There was the implied promise (in our case largely kept) of an easier, more interesting, and more comfortable life than the regular army provided. The ASA did not fall under the normal "chain of command," for the most part freeing us from the nuisance of inspections, formations, parades, barracks life, and other irksome military traditions. There was also that "cloak-and-dagger" image of being involved in clandestine espionage activities — not quite at the James Bond level but still a wee bit glamorous even though most of the work was about as exciting as watching paint dry. To the rest of the Army we were known as the "Titless WACS," a derogatory label referring to the former Women's Army Corps and comparing us to those other non-combatants. We just laughed this off as we watched the "real soldiers" parade around in formation with guns. IN REALITY, what the ASA really did was to provide cheap labor for the largely civilian-run National Security Agency (NSA). In those days before widespread computer usage the mission of the NSA needed a massive amount of manpower to intercept and sift through mountains of accumulated communications and electronic intelligence data gathered by listening in on enemies, potential enemies, and friendly nations as well. This would have been hugely expensive were it not for the draft. At that time, all fit young males in the United States between the ages of 18 and 25 were required to serve in the military for a minimum of two years. There were, of course, ways around this, but most guys did wind up serving their nation. For those who qualified, signing up for the ASA was a no-brainer. The work of the ASA along with its sister outfits the Air Force Security Service, the Naval Security Group, and of course the NSA itself were vital to the defense of the nation, especially during the Cold War years. When the draft ended in 1973 the days of NSA's "Rent a Trooper" were numbered as the enlistment times of the last to join ran out. As you would expect, the ASA had a notoriously low re-enlistment rate, so by 1976 the free ride was over and the ASA was disbanded. Its functions were melded into a new organization called INSCOM (Intelligence and Security Command), made up of professional career soldiers. By then, computers had taken over most of the routine work formerly done by the ASA draftees who were no longer needed. Cryptography was what the ASA was all about. Although formed in 1945, its heritage dates back to the code crackers of World War I at the Cipher Bureau of Military Intelligence of the War Department. Surviving demobilization in 1920, the Bureau continued on as a covert agency funded jointly by the War and State Departments. In 1929 the new Secretary of State decided that listening in on other countries' communications was not a gentlemanly thing to do, and so their support was terminated. At that time the Bureau's activities was transferred to the Signal Corps, where it remained until the forming of the Army Signal Security Agency at the height of World War II in 1943. Two years later, in 1945, all signal intelligence and communications security matters were assigned to the newly-formed Army Security Agency (ASA), an independent agency within the army but outside the normal chain of command. There it remained throughout the rest of World War II, the Korean War, the Cold War, and Vietnam. The ASA had listening posts, often called field stations, scattered around the globe. Their massive antenna fields picked up weak signals originating deep in the Soviet Union, China, North Korea, North Vietnam, East Germany, and even in friendly, allied countries. Within the fortress-like walls of its communications centers sat the "ditty boppers," who listened in and recorded the coded messages, which were then sent to cryptographers for cracking. This information was forwarded through channels to the National Security Agency (NSA) at Fort Meade, Maryland, where it was analyzed for the Defense Department. 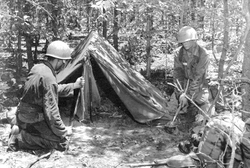 The two ASA units that I served in back in the 1950s were Headquarters ASAPAC at Camp Oji in Tokyo, Japan (July 1957 to May 1958) and JCRC-J at North Camp Drake, just outside of Tokyo (May 1958-October 1959). Click on their names to learn more. The same sort of communications intelligence was done by the British and Americans during World War II at Bletchley Park, just outside of London. Click here to read about it. Links: ASA Lives, Wikipedia ASA Article, ASA Website Links. Some interesting reading: Click on book titles in the boxes below to check them out, or on the Buy buttons to purchase. Mickey Mouse Money, Monopoly Bucks, call it what you will, those of us stationed in the U.S. military in the Far East in the 1950s could only use Military Payment Certificates (MPCs) and were not allowed to possess or use greenback American dollars. This was supposed to curtail black marketing and help keep the actual value of the Japanese Yen at the official rate of ¥360 to the dollar. In practice, it was a nuisance that kept your wallet stuffed with 5¢ paper bills. The only American coins we had were pennies. These bills came in denominations of 5¢, 10¢, 25¢, 50¢, $1, $5, and $10. Every so often, there were unannounced "conversion" days when everyone was confined to their closed post while the design of the funny money was changed. During my time this happened on May 27, 1958. When that day ended the older Series 521 bills became worthless, and anyone who still held them was stuck with pretty bits of colored paper. These were replaced by the Series 541, which remained valid until May, 1961. The practice of using MPC script instead of greenback dollars began, I believe, during the Korean conflict and lasted throughout Vietnam. Folks back home taking pity on your meager earnings could send you money orders to keep you in beer, but not greenback dollars. These MOs could be cashed at the bank or post office. Although MPCs could be readily exchanged for Japanese Yen (¥), it didn't work the other way around. It was actually illegal to convert yen into dollars without special permission from their government. This was to keep their fragile economy afloat, which succeeded all too well in the end. Of course, we quickly exchanged most of our MPCs for real money, namely Japanese Yen, to be used on the local economy. MPCs could only be used on U.S. military facilities, for such exciting things as laundry — or at the PX or EM Club. This conversion was done at the post bank, or downtown at the Tokyo USO. I encountered a problem when, near the end of my service in 1959, I sold my year-old Plymouth car to a Japanese dealer. This was completely legal as I had owned it for over a year and was soon leaving, but the catch was that I was of course paid in yen, which could not be converted, and I was not staying there long enough to spend the several thousand dollars worth of yen. So I set up a table at the end of the pay line on pay day, and sold yen to the newly-flush troops at the official rate, saving them a trip to the bank where they would have to wait in line. I then used the resulting MPCs to purchase money orders, some which I mailed home to be deposited in a savings bank, and the rest to an officer in Hawaii who loaned me the money to buy the car in the first place. MPCs are no longer used, having been replaced by the military in some areas (such as Iraq) with stored-value cards, which are similar to debit or credit cards and can be used to obtain cash or make purchases. RETURN to My Army Experiences Index. Ever wonder what those mysterious letters on your army orders meant? Here's a translator, straight from the failing memory of a one-time unit clerk (me). There are undoubtedly more of these time savers that I've overlooked. Just think of all the wear and tear on typewriters these abbreviations have saved, to say nothing of more efficient use of the ribbons and mimeograph ink. There must be more, and some of you know them! Please leave yours on the comments thread or just e-mail me. Already, they are coming in. Glenn Kunkle just added 20-some definitions. These are labels that I pulled off the wet bottles way back when. A bit ratty from age, but still a nice keepsake. My favorite was San Miguel, which was not European but came from Manila in the Philippines. Years later I also encountered the same brand in Madrid, Spain.I was also fond of Holsten Lager from Hamburg in Germany. And who could forget Sapporo, that tasty brew from frozen Hokkaido? Sadly, I don't have a label for it, just memories. RETURN to Beer & Wine Index. Back in Olden Times — the 1950s — military uniforms were not nearly as macho or snazzy as they are today. With a draft, they didn't need to be. No camos, no black berets to lure potential enlistees. Just OD (olive drab) all over the place, except for summertime khaki. The dreary winter "Class A" uniform was the worst, a shapeless bag that made you look like a bellhop in a Soviet backwater town. That's me in the photo on the right, modeling this at Fort Slocum, NY, in 1957. The "A" patch on my left shoulder meant that I was in the First Army (New England and New York). Another identifying emblem was the round brass thing worn on the left collar. During basic training this showed the image of an eagle; after advanced training it was replaced with a symbol of the particular branch of the army the soldier was assigned to, such as crossed rifles for infantry or a castle for engineers. Since our unit, the Army Security Agency, was so secretive, we just continued using the "unassigned" eagle (photo, left). Regardless of which unit you were in, you always wore a similar brass disk with the letters "U.S." on the right collar of any "Class A" uniform. All brass, naturally, had to be kept polished at all times. Good old Brasso™. Once we got to Japan we had the "Fuji" patch (photo, right) sewn on the left shoulder. This only meant that we were stationed in Japan. Also while in Japan, us ASA types wore a security badge on a chain around the neck or clipped to a collar — but only while on post. On first arrival these were red, but as soon as all clearances were confirmed a green one with laminated photo, fingerprints, and some secret circuitry was issued. Later, at JCRC-J, we no longer used security badges since everyone knew everyone else. We also had name badges, such as mine from Camp Drake in 1958-59 (left). The summer "Class A" uniform was much nicer and more comfortable. It consisted of a long-sleeve khaki shirt (sometimes worn with a tie) and khaki pants, worn with black dress shoes and either a hat or a cap while outdoors (or indoors while armed). All through basic training we of course wore the utility (fatigue) uniform of dark olive drab (OD) shirt, bloused pants, combat boots, utility cap (or helmet), and a really sharp-looking field jacket (photo, right, of me at Fort Jackson, SC). I did not wear these during my advance training at the Information School, but often did for the first few months at the ASAPAC Personnel Processing Detachment in Camp Oji, Tokyo. After that, it was Class A's all the time. Except once. That was when I had to go out on the firing range to demonstrate my meager abilities at shooting the .45 pistol that I carried on off-post courier missions. The office staff responded with quips like "you going off to war?" In 1958 the ugly Class A winter uniform was replaced with a much nicer one in a dark green shade, which remains in use today (I think). Each soldier had a choice of receiving one such uniform free, or of getting a "kit" for making one plus some cash to help pay the tailor. Since the kit had a better grade of wool I chose the latter as I had to wear the thing every workday from about September through April, or thereabouts. This was worn with a pinkish-tan dress shirt, black tie, black dress shoes, and a dark green cap. The photo on the left shows two of my co-workers at JCRC-J, North Camp Drake, Japan, in 1959. They are, from left, Sgt. Hicks and SP4 John Jubb. Starting in 1957 the army introduced an optional Class A summer uniform, which could be worn in place of the regular khakis if desired. That is, if you could stand the laughter. Obviously inspired by the traditional Boy Scout uniform, it consisted of a very nice short-sleeve shirt with open collar, made of lightweight khaki, reverse-pleat shorts, anf khaki-colored knee socks. Remember, this was the 1950s, when grown men were not yet up to wearing shorts in public. The cool shirt, however, was much appreciated and soon the army relented and allowed its use with long khaki pants. That was the end of wearing shorts. The photo below shows some of the guys at JCRC-J making a fashion statement. OF COURSE, whenever off duty we wore civilian clothes. Always. Most of us had "civies" shipped over from home as the pickings at the PX were pretty awful. The Ship's Store at Yokosuka Naval Base, south of Yokohama, however, had some sharp duds. Japanese clothes made for the local market just did not fit us Westerners very well. In fact, the army actively discouraged wearing uniforms off base in Japan as they gave the impression of a foreign "occupation." There were some rules concerning civilian attire. They had to be clean and neat, and such items as blue jeans were not allowed. One guy I knew got around this restriction by dying his black. But on the whole we dressed about the same as we would have back home, both off-post and on-post while off duty. January 15, 1957 was the day I began my service in the U.S. Army. At that time we had this little thing called the Draft, which required all fit males in America to serve at least two years in the military — except those, of course, who found ways out of it. Most did not, and most completed their duty. Since I qualified for a high security clearance, I choose to enlist directly into the secretive Army Security Agency (ASA) for three years instead of two years in the Infantry (or whatever). I never regretted that choice. Until that fateful day I had an exciting job in New York that I hated to leave, but as there was no choice I returned to my parents' home in Allentown, Pennsylvania just before Christmas for a few weeks of fun before putting on the uniform. A high-school friend named Vince was called up at the same time, and we went through Basic together. It began with a train ride from Philadelphia to Washington, which was blanketed in snow at the time. With several hours to kill, we hit the bars near Union Station before boarding the midnight train, a slow sleeper to Columbia SC. Arriving the next morning, my first impression of this southern city was not a good one. Right at the end of the station platform were two drinking fountains; one nice and the other a primitive mess. The messy one was labeled "Colored." Remember, this was 1957, years before the civil rights movement. A bus took us to Fort Jackson, where we pledged allegiance and then had our first taste of army chow. The mess hall was like a very basic cafeteria. Above the serving line was a large sign that ordered "Take All You Want — Eat All You Take." The food was actually not too bad, or maybe I was just super hungry. Next, we were taken to another building where we shorn of hair, stripped naked, deloused, and issued uniforms. After which we were assigned to a training unit — mine was Company B, Eighth Battalion, Second Training Regiment. The barracks that we would call home for the next nine weeks looked like those in the photo above. These were pre-World War II wooden buildings that each housed about a hundred guys. The double-decker bunks were close together, allowing absolutely no privacy at any time. Especially in the latrine, where the toilet bowls were lined up next to each other with no separating panels at all. Well, I thought, grin and bear it, it will all be over soon enough. One of our first lessons was familiarization with the standard infantry weapon of the time, the M-1 30-calibre rifle, often known as the Garand after its inventor. Besides learning to take care of it, and eventually to shoot it, we also had to be careful NEVER TO CALL IT A GUN. Doing so resulted in the cruelest of penalties — having to stand in front of the company and, pointing to the rife, repeating "This Is My Rife...," then pointing to your crotch and saying "...This Is My Gun," followed by "This Is For Killing," and "This Is For Fun." Soon we went for a long hike, weighted down with a full pack and rifle. 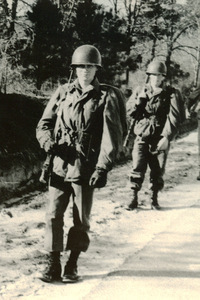 That's me on the left, marching through the sandy pine barrens of Fort Jackson on a cold winter's day back in 1957. Every once in a while we would stop for a five-minute smoke break. At that time nearly everyone smoked, and cigarettes cost only 10¢ a pack at the PX. And there were free ones in the C-Ration meal kits, except they were Lucky Strikes in the Green pack — making them of pre-World-War-II vintage. Marching, military drill, and physical training wasn't much fun, but it was probably good for us. We did a lot of it those first few weeks. There was also the confidence course, which taught physical prowess, coordination, and endurance by climbing over obstacles and maintaining balance on narrow, elevated logs. And the hated gas drill, where we inched our way through gas-filled rooms while wearing gas masks. For me, the best part was on the firing range. I was a photographer before being drafted, and photographers usually are good marksmen as they already know how to concentrate on a subject (target), hold a camera (rifle) steady, and gently squeeze the shutter button (trigger). 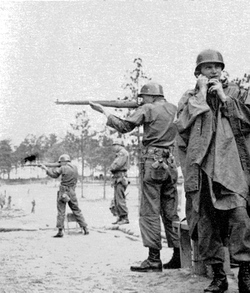 The first actual firing began on the range, with relatively close targets, then progressed to greater distances and finally to simulated combat. The photo to the right shows members of our Company B in transition firing. That's me on the right, yapping away on the field telephone. For simulated combat we used blanks instead of real bullets. These stung a bit if you got hit, but were otherwise harmless. It was loads of fun, just like being a little kid again. Until, that is, I made a bad mistake. I was to attack with a rifle grenade, which was an explosive missile stuck on the end of the rifle barrel. Shooting it required holding the rifle in a certain position so as not to get hit with the recoil. But in the heat of battle I held it up tp my eye, as with regular ammunition, and fired. The result was a badly bruised face and one black eye. This did not get me out of pressing on, however. One fine winter day in February we went on bivouac, otherwise known as camping in the woods. Having been a Boy Scout, I was familiar with this, but here we did not have real tents. Instead, we had "shelter halves." This was just a piece of canvas which, when joined to another one, could be used as a crude, makeshift shelter (photo, left). Fortunately, my shelter mate was smart enough to dig a small ditch around our "tent," just in case it rained. It poured that night, and then the temperature fell to below freezing and the water turned to ice. But we were snug and dry inside. For breakfast that morning we had C-rations — cold canned spaghetti. The infiltration course was the scariest and most thrilling event in the whole nine weeks. Adding to the drama was the fact that it took place on a dark and rainy night. In this course, you climb up out of a trench and crawl uphill in the mud, sometimes through barbed wire, being VERY careful not to raise your head. Why not? Because right above you is live machine-gun fire. At the top, safely beyond the machine guns, are "enemy" entrenchments, into which you toss a hand grenade, which goes boom. Lots of fun, if a bit messy. Toward the end we were allowed a weekend pass, which meant going to nearby Columbia, the state capital of South Carolina. A friend and I took a bus there, hit the bars on the main drag, and stayed overnight at a nice hotel next to the Capitol building, I believe it was called the Wade Hampton or something like that. The only booze we could get on post was 3.2 beer, so this trip was a treat. The only worry that I had all this time was that my security clearance would not be approved, meaning three years in the infantry instead of the Security Agency. But it came through with no problem. Alas, all good things must come to an end. On March 23rd, 1957, we departed Fort Jackson and flew to Washington, then I continued on to Allentown PA for a short rest before driving north to Fort Devens, just outside of Boston, for further assignment within the Agency. ONWARD to What We Wore: Fashions in the army. CLICK HERE to return to my Military Service index. CHECK OUT these good, current books about surviving Basic by clicking on their titles in the boxes below. This will also lead to other books on the subject. More photos and anecdotes are coming in. Here's one taken at the Rocker 4 Club in downtown Tokyo in September of 1956 during Lt. Malloy's and Sp 5 Phil Hood's going home party, sent in by Noel Garland. Top row, left to right: Larry Bradbury, James Skiles, Noel Garland, Bob Osulfka, Jack Cartwright, Ken Van Elsacker, Joe Cywinski, Earl Creel. Middle row, left to right: Larry Silvey, Frank Robichaux, Smitty, Lt. Malloy, Sgt. Daughterty, Phil Hood, Bob Sandor, and Ed Gallagher. Bottom row: Sgt. Frank Romness, George Gowdy, Henderson. In front: Stanley Stokes, Frank Bilbro, Ted Kuriger, Joe Conte. Front row, left to right: ?, Lt. Morris Green, ?, Sgt. Girton, ?, Eddins? Seated, middle row: Paul Klavoon, Joe Conte, Irving Ames, ?, Gilbert Gallegos. Standing: Kelso Yarnell, Milton Hardy, George Nagel, Jim Brolly, ?, ?, Alton Johnson, Frank Paul, Art Nack, Charles Cadle, ?, George Chiounard (sp), Don Self, Oliver Parling, Jack Wilson, ?, Baughman perhaps in front of Jack Wilson. The above is from September 1954, depicting a parade on the retirement of the Post Commander, Col. Edwin G. Greiners. Taken from third floor of mess hall building, motor pool in background. 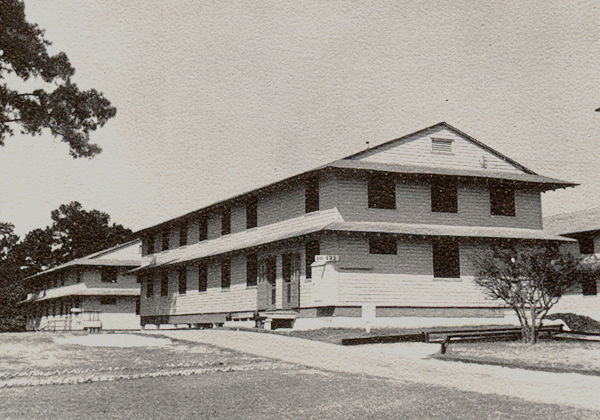 The dark structure atop the Headquarters building billets was, I think, NCO quarters, but in early 1958 it became what was left of the Personnel Processing Detachment, most of which had moved to Hawaii. By spring I was about the only guy living in it, last set of windows on the right, just before the taller building. The front gate seen from Oji alley at dusk. The Lucky Laundry on Oji Alley. With luck, you got your stuff back. The commuter train to Oji, seen downtown Tokyo. In the NCO Club at Oji, Nov. 14 1955, sent by Noel Garland.